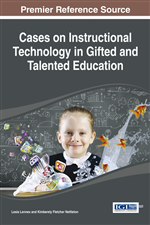 The following vignette describes a way to use different types of technology with gifted students. The students' grades ranged from three through six in a school district. Gifted students used a variety of skills—leadership, creativity, performing arts, and technology—to develop a motivational video. The video was designed to be used to generate excitement for upcoming state assessment. The building administrator suggested the project, and the gifted students were engaged in almost all stages of production. From development to the final production, the students were engaged. Students used iPhones, iMovie, and a MAC computer to develop their product and produced a video to motivate fellow students. The next time I pulled out the students after my principal made his request, instead of separating the students by grade level, I brought all three grades together. The students were clearly wondering what was going on because of the change in routine. The principal showed the students a variety of motivational videos; the ones he had previously emailed out to the staff. These videos were all found on YouTube. The principal challenged the students to create one of their own.to share with the school.